New Windsor School - Spreading Kindness and Doing it with Love! 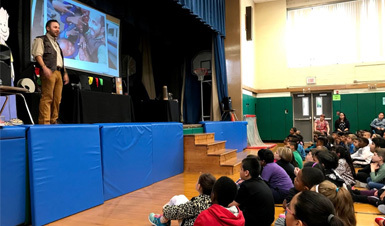 This past Monday, October 16th - New Windsor Elementary held their Kindness Assembly hosted by special guest speaker Cosmo and his buddy Ned from the organization "Ned's Kindness Adventure". The assembly included storytelling, music, interactive videos, magical illusions and interactive student participation. Students learned key themes such as: "caring is cool", "include others", "each person matters a whole lot", and "different can be good". By demonstrating simple acts of kindness, students learned the impact it could have on their whole school community and all the love it would spread. See some of the photos from the event.